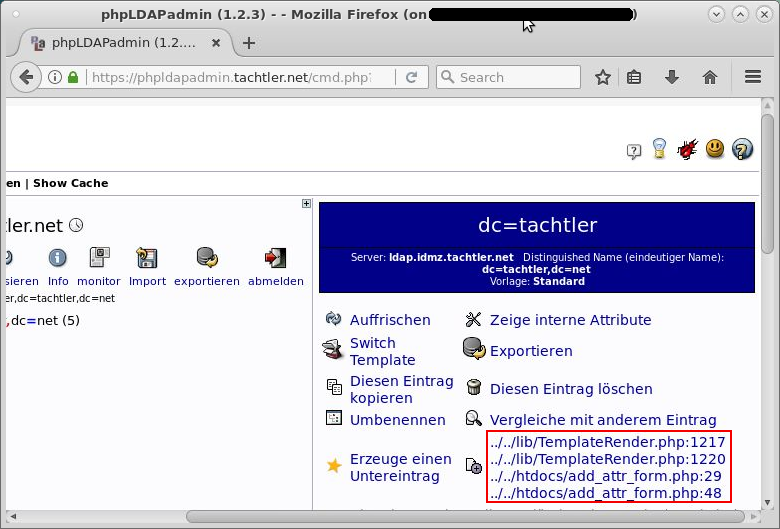 Die Webanwendung phpLDAPadmin (auch bekannt unter dem Namen PLA) ist ein Web basierter LDAP Client. phpLDAPadmin bietet eine einfache, von überall zugreifbare, mehrsprachige Administration für einen z.B. OpenLDAP-Server. 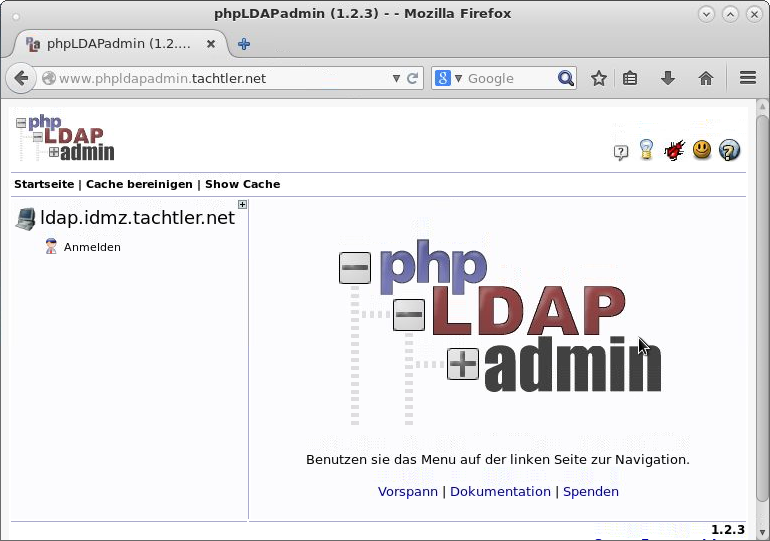 phpLDAPadmin verfügt über eine hierarchische Ansicht und die erweiterten Such-Funktionalitäten ermöglichen ein intuitives navigieren und administrieren innerhalb des LDAP-Verzeichnisbaumes. Zur Installation von phpLDAPadmin über ein rpm-Paket, soll hier das Repository eines Drittanbieters genutzt werden, da phpLDAPadmin nicht im CentOS-Repository enthalten ist. HINWEIS - Aufgrund von anderen Installationen, sind einige benötigte Pakete bereits auf diesem Server installiert! Mit nachfolgendem Befehl kann überprüft werden, welche Inhalte mit den Paket phpldapadmin installiert wurden. PhpLDAPadmin is a web-based LDAP client. functionality make it intuitive to browse and administer your LDAP directory. making your LDAP server easily manageable from any location. Nachfolgend sollen alle relevanten Änderungen an der Konfigurationsdatei dargestellt werden, um die Web-Anwendung phpLDAPadmin mit einem OpenLDAP-Server nutzen zu können. ** Make sure that <?php is the FIRST line of this file! * that are defined in config_default.php. * To override a default, use the $config->custom variable to do so. * This file is also used to configure your LDAP server connections. * defaults that have been defined in config_default.php. * check config_default.php if you want to see what the default is. Localization is not complete yet, but most strings have been translated. links will not be shown and the command action will not be permitted. hide attributes from the user, you should use your LDAP servers ACLs. attributes, and they will not be allowed to be modified on the "back-end"
order. You can use default attribute names or their fridenly names. store your login dn and password. web server in a persistent session variable. login will be required to use phpLDAPadmin for this server. figure out authorization id by itself from bind distinguished name (DN). /* SASL auth security props. and log in as that user. necessarily have the uid attribute. server may automatically calculate a default value. Nachfolgend die Erklärungen zu den Änderungen in der oben vollständig gezeigten Konfigurationsdatei. WICHTIG - Der Standard ist dn und NICHT uid !!! WICHTIG Falls der OpenLDAP-Server keinen anonymous bind erlaubt, kann dies hier deaktiviert werden !!! ein virtueller Host im Apache HTTP Server eingerichtet werden. durch die Version, welche in Vorgängerversion von phpLDAPadmin - Version 1.2.2 - enthalten war, behoben werden. Connecting to sourceforge.net (sourceforge.net)|216.34.181.60|:443... connected. Connecting to downloads.sourceforge.net (downloads.sourceforge.net)|216.34.181.59|:443... connected. Connecting to netcologne.dl.sourceforge.net (netcologne.dl.sourceforge.net)|78.35.24.46|:443... connected.